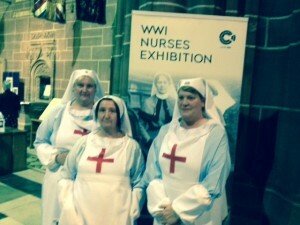 You are here: Home > Exhibition at Liverpool Cathedral dedicated to WW1 nurses who lost their lives. Exhibition at Liverpool Cathedral dedicated to WW1 nurses who lost their lives. In 1929 a memorial to the Liverpool Nurses who gave their lives in the Great War was unveiled in the Lady Chapel of Liverpool Cathedral. It is a rectangular sculptured panel set in a sandstone framework and the central panel shows a nurse binding the head of a wounded soldier. The soldier represents Everyman and the figure of the woman displays the spirit of the Nursing Profession. This week, an exhibition dedicated to those Liverpool nurses who gave their lives in WW1 opened within the Lady Chapel. Val Thornes and I were invited to attend the inaugural viewing, and were impressed by the amount of research done by Canon Val Jackson and her team to create the stories of individual bravery and service. There are 20 names commemorated which include nurses from Scotland, Ireland and Wales who came to train or work in Liverpool during WW1. Many worked at the 1st Western General Hospital, Fazakerley, which was used to treat returning casualties of war. Others volunteered to serve abroad in places as far afield as Malta, Mesopotamia, Salonika and Serbia, as well as in France. Sadly all of them died either during or shortly after the war of infectious diseases picked up as they tended the wounded. Each of their stories is individually displayed and well worth reading. It is humbling to think of the sacrifices those nurses made to look after their patients in their hour of need. The exhibition is open daily during 8am to 6pm until 21st October and is well worth a visit. You will also get a chance to see the Nurses’ Memorial panel. I would recommend that anyone visiting Liverpool during the next month or coming to the Nurses’ League Annual Meeting, takes the opportunity to see it.